Imagine the youth of your organization enjoying the life-affirming experience of writing and performing their very own play! Give your students a voice to express their own strong ideas and opinions! New Moon Productions’ “Share Your Story” – A Play Creation Workshop is an enriching and life-affirming theatre education program whose goal is to guide children (generally ages 10-17) in the creation and production of an original theatre performance piece based on an idea, issue, or theme that is deeply felt by the students. Past topics include “the inherent worth and dignity of every person”, “care of the environment”, and “the impact of war on families”. Over the course of the workshop, each student contributes to the creation of the story, writes the text, explores movement, suggests the staging, and rehearses and performs the show for the community. and perform the finished play for the public. 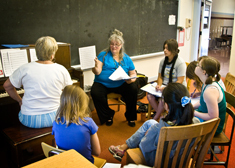 The “Share Your Story” workshop’s focus on education and mentorship is also unique. 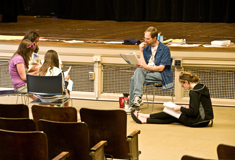 Our instructors gently guide the students to fully understand the issues and ideas they are writing about, then take students on a journey of discovery to expand their existing talents in storytelling, writing, character development, acting, and stage movement. 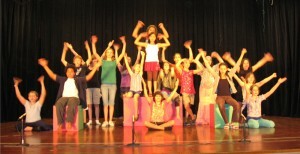 The process encourages the students to grow as young human beings through an inspiring artistic endeavor. We will bring this program to you — anywhere in the United States! Call or write us now for a full proposal and brochure, or fill in the Inquiry Form. Summer Camp: two weeks, Monday-Friday 9am-3pm. Summer Camp: three weeks, Monday-Friday 9am-3pm. After-School Workshop: two weeks, Saturdays & Sundays 10am-4pm and Mondays, Wednesdays, Fridays 6-8:30pm. Intensive Workshop: one week, Sunday 10am-5pm, Monday-Friday 9am-5pm, Saturday 10am-5pm. Or tell us your specific day/time needs, and we will work with you to develop a custom workshop format! Generally, two performances are held, one on the evening of the last day of the workshop and one the following afternoon or evening. We will work with you to develop a program that best suits your organization, students, and goals. This program is also an excellent fundraiser. Ask us how you can raise up to $3,000 for your organization. Call or write us now for more information, or fill in the Inquiry Form. We look forward to discussing how you can bring this life-affirming program to your young people. Students write the script with Michael Wehrli. [New Moon Productions] has given many children the opportunity to express themselves and to shine in a light they might not be able to otherwise. Students are given the chance to be unique and to show their friends and families a skill set new to them. 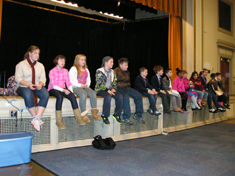 Students create the music with Kristina Jones.